I'm originally from a small town or what is also called, "the country." I saw butterflies all the time. But when I moved to the city, I hardly noticed any. Maybe it was because I was so caught up in the "hustle and bustle" and the newness of the city that I no longer noticed them. Because in the country, the pace is much slower, it's so easy to stop and enjoy them that, their presence can be taken for granted. But it's not only the butterflies that were taken for granted when I moved to the city. Organic food--before I knew what organic food was and before it became such a catch phrase--was a way of life growing up. We had what is called "free-range" eggs all the time from our own chickens or we'd buy from a local when our hens were slow to lay (eggs). We'd get some picked-fresh fruits and vegetables from our own trees and gardens and sometimes from those who shared theirs. Fish was another thing. We rarely, if ever, bought fish from the store. Fish my family bought primarily came from someone we knew who fished or "the fish man". This was a fellow townsman who went fishing a few days a week. He would then drive slowly down the street to sell his catch. And we knew the fish were fresh: they were sold alive! My, those were the days. 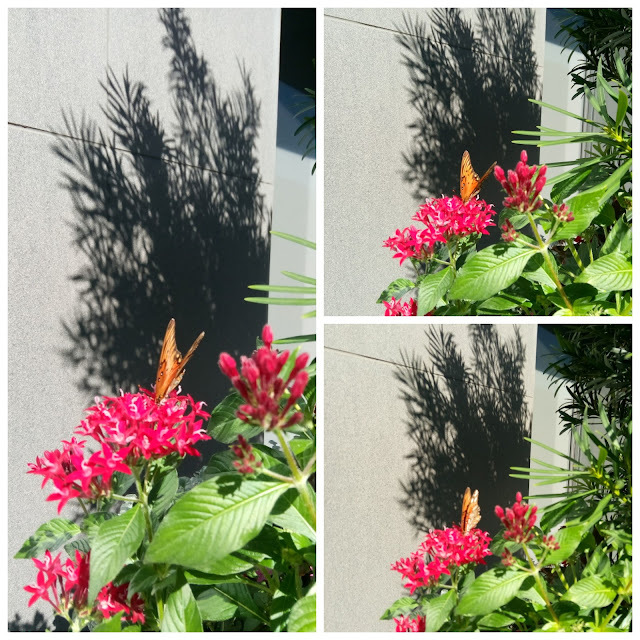 May my sighting of that beautiful butterfly in the middle of the concrete jungle and the privilege I got to photograph it remind me to appreciate the beauty of what God has given us to enjoy. White Privilege at its "Finest"
Well, well, well... Look who jumped on the Anti- #TakeAKnee bandwagon like it's a national crisis unlike the real reason behind the kneeling. But instead of facing head-on, the ugly truth of police brutality, the murder of unarmed African-Americans, inequities in arrests, prosecutions and imprisonment of people of color versus that of Whites as well as other injustices; those who don't like it relegate #TakeTheKnee to just being unpatriotic and disrespectful. They skip over the important issues that started it all by accusing "kneelers" of disrespecting our military and veterans. Speaking of "disrespecting our military and veterans" what about our military and veterans who, during Segregation, STILL had to endure the same humilitions they suffered before war when they returned home from war fighting for freedoms they could not enjoy. I, personally have heard some say, "if they can't stand for the anthem, they can leave." Of course that makes "perfect sense", especially since the vast majority of African-American's ancestors were kidnapped and brought here. Where will African-Americans go? We certainly don't have a country to return to. By the way, there is no law, nor is it in the Constitution that we stand with our hands over our hearts for the National Anthem, just saying... It's a TRADITION! Now, I could almost dismiss this "protest" as just our POTUS using our VP to, once again, systematically tear away at individuals right to Free Speech, especially when it is not flattering to him. BUT this has turned out to be much more than an insincere, fake protest that is widely reported and shown to having been staged. As despicable as that should be, what adds insult to injury is the cost of these shenanigans. Reports show costs upwards of $250,000 (that's not including the added cost of extra local security, additional screenings, etc.)! $250,000 of TAX-PAYER MONEY; money that could have been much better spent. Much better spent actually giving people hurricane relief than denying them; much better spent feeding the hungry, helping to house the homeless, or educating young people. Oops, my bad... Because many listed are people of color, thus, not in the POTOS' "base" they wouldn't count. Yes, somehow, I see some supportive of this waste because you just can't put a price tag on puttin' Blacks "in their place". It's sad that this Nation's Administration is all up in arms over one company's employees exercising their CONSTITUTIONAL right​ to Free Speech. In the same breath, they scheme and "plan" to stifle that very right they claim our military and veterans (who they say they strongly revere, but have failed them miserably via the VA System and otherwise) fought and gave their lives to protect. Now, who's disrespecting our military and veterans? Unfortunately, ignoring problems and turning a "blind eye" to them and disparaging those affected is a way of life for the perpetrator of such. However; those taking a knee as well as those standing behind them don't like it, and ARE NOT leaving. And if you're going to "chime in" on an issue, at least come to the side of Liberty and Justice FOR ALL.The last time I checked, this country doesn't belong to just one man, one group, one side, contrary to the belief of some. Believe it or not, if the critical issues that fueled #TakeAKnee would be addressed AND substantial actions be taken to solve them, it would be beneficial to ALL Americans. Now that would truly "make America great again." United we ALL stand, divided, we fall. God help America. ... at home. I remember when I would be out of the house by 11:00 p.m. to be headed to the club. If we (me and friend/friends) left earlier, it didn't seem to be quite "jumpin'" yet, any later, there isn't much point. Now most of my Saturday nights consist of babysitting my grandchildren while my daughter works and actually watching Saturday Night Live by 10:30 p.m. I actually look forward to the opening monologue and the Weekend Update segments... I need a life. Well, actually, I have a life. And babysitting my handsome grandson and my beautiful little grand daughter makes it all worth it. Sometimes I feel like I would, but I wouldn't trade them for the world. But that's life! Time for the realy party!!! Now, I'm going to lay down and finish watching SNL.